This is a major milestone in renewable energy. Within the past six years, British energy generated from coal has dwindled from 40 percent to a minuscule 7 percent. Not only has the country drastically reduced its dependence on fossil fuels, it has, in the same breath, adopted renewable resources on a much larger scale. In fact, currently, Britain generates twice as much electricity from wind power as it does from coal. Not including Northern Ireland (which is calculated separately, as its electric system is shared with the Republic of Ireland) 15 percent of British energy came from wind in 2017, up from 10 percent in 2016. This increased wind power helped Britain to decrease its coal use and halt rising natural gas generation. Increasing electricity generated from wind power is a result of both the creation of more wind farms and a windier year. Yet while wind will fluctuate over time, these newly built wind farms will remain pillars of renewable energy in Britain. Wind power is making up a significantly larger percentage of electricity generation in Britain, with wind output increasing by 14 terawatt hours between 2016 and 2017. This amount of energy is enough to power 4.5 million homes. Additionally, wind power is becoming cheaper as a result of this increasing adoption. Within the government auctions for low-carbon electricity last year, two winning bids had a “strike price” of £57.50 per megawatt hour (MWh), which is considerably cheaper than a 2012 price of £92.50/MWh. Renewable energy use is effectively pushing out fossil fuels in Britain. 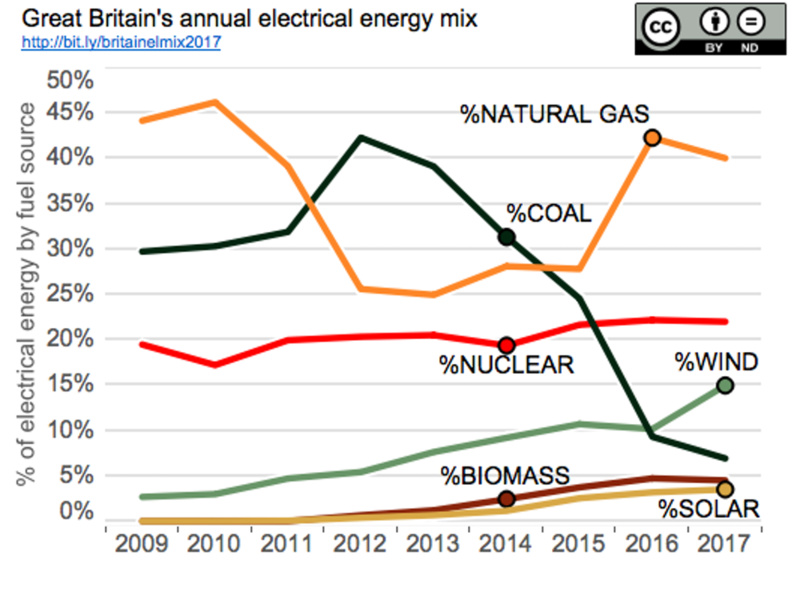 In October 2017, 25 percent of Britain’s electricity came from wind, solar, and hydroelectric power, a new record. Not only are more and more people and companies concerned about the growing realities and anticipated repercussions of climate change, but fossil fuels are becoming the more expensive option — and the bottom line is important to everyone.